"This is something I just tinkered with until it came out to my liking. I tried it with jelly on the inside, but I couldn't taste it, so I just decided to leave the jelly out. The bananas still stay in between the bread without it. It's very delicious and low-fat as well. It doesn't even need syrup." Combine egg substitute, soy milk, vanilla extract, and cinnamon in a shallow dish. 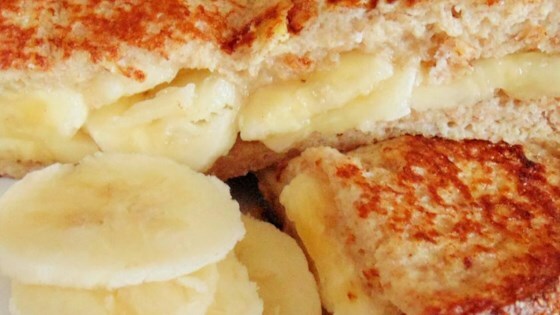 Overlap banana slices over 1 slice of bread. Place second slice of bread on top and press down so sandwich holds together. Dip sandwich in egg mixture and coat both sides. Heat a nonstick skillet over medium heat; spray with cooking spray. Place sandwich in hot skillet and cook until browned, about 3 minutes. Flip it over carefully and cook second side until browned, about 3 minutes more. Choose a brand of light or regular whole wheat bread that is not too soft.